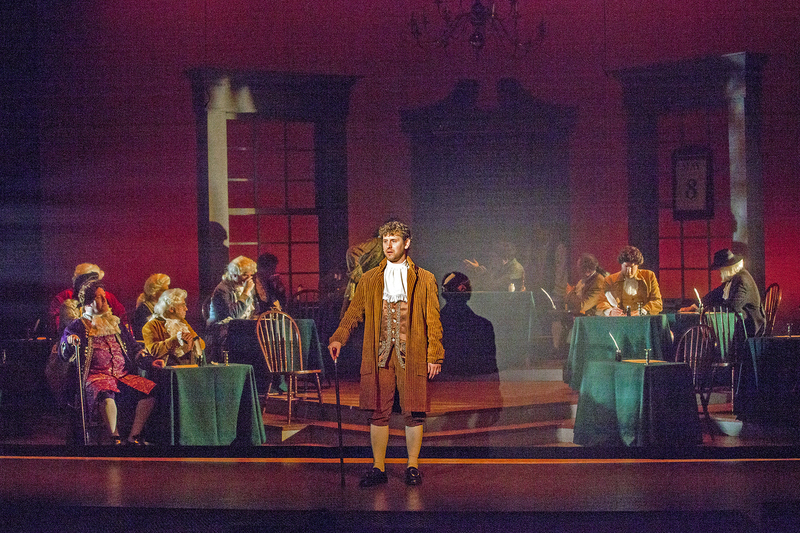 One can’t help but be inspired by the Tony Award winning musical, “1776” even through a few technical glitches, dropped lines and occasional pitch problems with both actors and orchestra. That’s what plagued Insight Theatre on opening night of the stirring saga brought to the stage by playwright Peter Stone and the music and lyrics of Sherman Edwards. Those few missteps aside, this is a great way to celebrate our country’s independence since most of the moments on stage are based on how the Continental Congress actually fought it’s way to the Declaration. 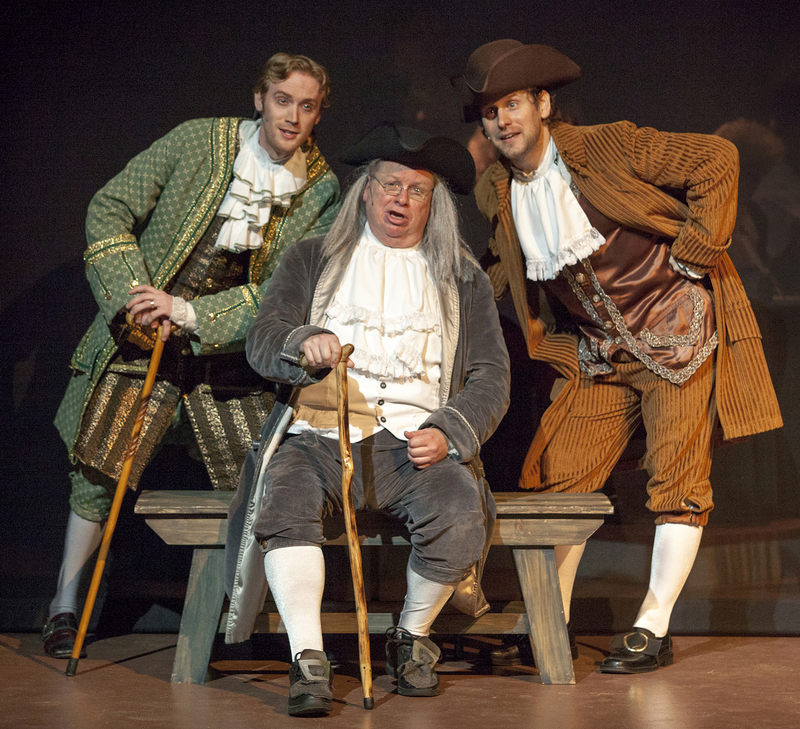 Martin Fox leads the way with a stirring and insightful portrayal of John Adams. Whether dealing with Congress or his dear wife, he is tenacious. His powerful closing song, “Is Anybody There?” brings chills to the spine as you can feel the heartbreak of the man and the nation. His cohort in the fight is Ben Franklin and Tom Murray brings all of the joy, humor and wisdom to the role. Add the stoic but equally committed Thomas Jefferson as brought to brilliant life by Peter Meredith, and you’ve got the dynamic trio who helped “hatch the egg” that would become America. Michael Amoroso, despite a few vocal problems on opening night, brings the proper, uninhibited spirit to Richard Henry Lee and Christopher Hickey is solid as the lone dissenter in the fight for independence, John Dickinson. Michael Brightman is in proper “yes” man mode as James Wilson who actually turns the whole question of independence on its ear. And GP Hunsaker is perfect as the great mediator and president of the Congress, John Hancock. Janine Burmeister brings a sweet disposition and even sweeter singing voice to Abigail Adams. The scenes between her and John are lovingly portrayed even though they remain separated by the width of the stage. And the only other woman on the scene, Martha Jefferson is given a lively and spirited turn by Taylor Pietz. This is truly an ensemble cast and, despite naming only a few, the entire company steps up and has their moments during those days leading to the signing of the Declaration of Independence. It’s a tight cast and they work extremely well together to bring reality to the events that unfold on stage. Insight Artistic Director Maggie Ryan has directed “1776” with a keen eye for detail. Perhaps a bit long with the first act reaching close to the two hour mark, we do get to the matters at hand rather quickly in the second act. Zoe Vonder Haar has provided the delightful choreography while the beautiful set design of Bill Schmeil and lights of Maureen Berry combine to set the proper mood. Charlie Mueller is in charge of the musical direction. At my household, we’ll still continue our long tradition of watching the film version of “1776” on the holiday itself. But it’s nice to have a stage version available appropriately fitting into the actual Independence Day celebration time frame. Visit Insight Theatre Company at insighttheatrecompany.com for more information or to get tickets. 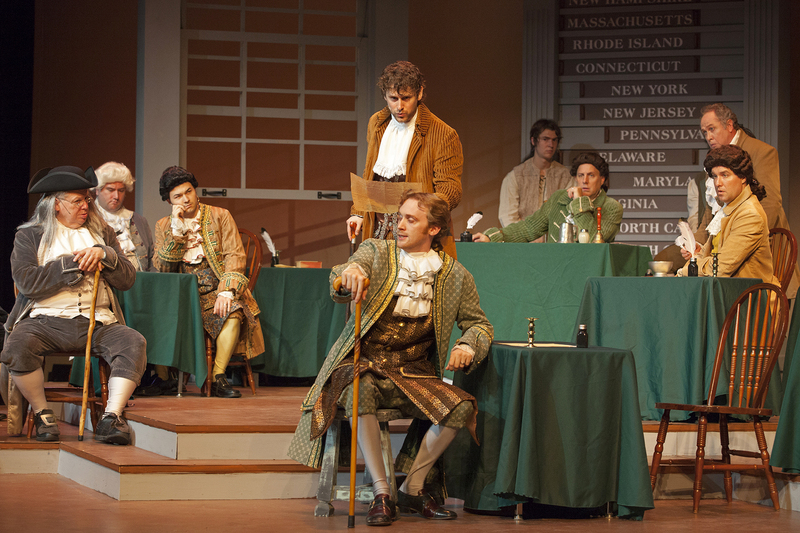 “1776” runs through July 7th. This entry was posted on June 28, 2013 at 9:43 pm06 and is filed under Uncategorized. You can follow any responses to this entry through the RSS 2.0 feed. You can leave a response, or trackback from your own site.